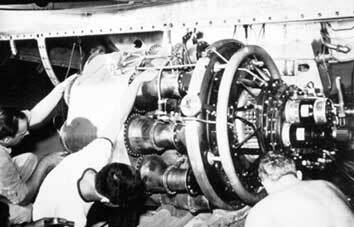 Engine: 2x General Electric I-A turbojets. On 5/9/1941 Bell Aircraft of Buffalo, New York were approached and asked if they would like to build a fighter around the new license made General Electric Whittle jet engine the I-A, they accepted the job, with a contract being signed on the 30/9/1941 for three aircraft with a dead line of completing the first prototype in eight months. As the engines were being built at the same time as the XP-59, the Bell design team adopted a conventional approach to the new aircraft resulting in that with in two months they submitted a design. 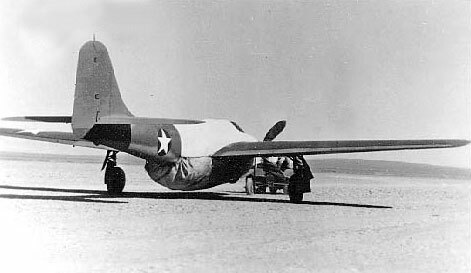 The USAAF approved the plan and the construction of the prototype got under way, the first XP-59A was ready in the late summer of 1942 and was shipped to Muroc Dry Lake on the 12/9/1942 for ground testing (fitted with a dummy propeller). Even before this in March 1942 the USAAF ordered 13 YP-59 pre-production aircraft . On 1/10/1942 Robert Stanley inadvertently became airborne for a short time, however the official first flight was on the 2/10/1942. As with any new engine there were a number of problems with the General Electric I-As, but with time remedies were found and work on the XP-59 continued. The first YP-59 flew for the first time in August 1943 and the aircraft was given the name of "Airacomet". The YP-59 had more powerful engines than the XP-59 the General Electric I-16, but still the performance was no better than the first XP-59. The last three YP-59s were fitted with the armament to be fitted on to the P-59 production aircraft. One YP-59 (42-22611) was shipped to the UK in late 1943 being exchanged for a Gloster "Meteor"Mk I. Just before the first flight of the XP-59 the USAAF ordered 100 P-59 aircraft, however with the performance of the YP-59s being some what disappointing and being considered by the USAAF unlikely that any appreciable improvement would be forthcoming, the Airacomet was relegated to a training roll, with the ordered form 100 aircraft being halved to 59 on the 30/10/1943, with the last aircraft being delivered in May 1945. After the 20th aircraft the rest were completed as P-59Bs having an increased fuel capacity. Most P-59s went to the 412th fighter group of the Fourth Air Force where they were to give the USAAF valuable data about converting to jet aircraft.